We’ve pushed up a couple updates for Missions which we will be testing over the weekend. When you create a Mission you will now be greeted with an automated assessment of “Mission Quality”. The grades for Mission Quality go from A-F (F is not so good) and is scored based on an algorithm that we will be updating constantly. The algorithm takes into account not only what the community has told us, but also where we as a company and as a team believe Missions shine. 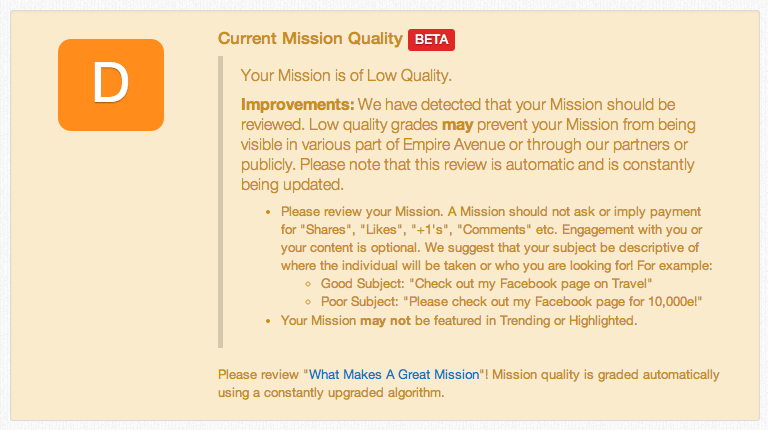 The Mission Quality Grade is only visible to the Mission Creator and Empire Avenue! We want you to engage people with catchy content, good headlines, great descriptions and then reward them to discover your content, your profiles and your networks. Use your imagination and come up with great marketing to encourage people to take your Missions over others. Initially we are not using these grades to increase/decrease the visibility of your Mission, however as we adapt and expand the system higher quality missions may be more visible. This is especially important as we look for ways to get your Missions seen beyond Empire Avenue. 1) Using “Free Eaves” as a marketing tactic outside of Gift Missions is extremely discouraged and you will find that your Missions are scored extremely poorly. 2) Please read “What Makes A Great Mission”. A Mission is a way for people to discover content, people and networks. You may “ask” for engagement but the choice of engagement is up to an individual. Eaves are not payment for an action, they are a reward for checking your content, profile or network.